I wasn’t tagged by anyone in particular though I have been asked a couple of times (okay, so maybe a lot of times) what items I used in a day-to-day basis and how much each product costs. I did make a Youtube video of my everyday face routine (LINK HERE), however, I wasn’t that specific in terms of the products and the price tag that they have. Please bear in mind that these products were not purchased in one day. Some were sent by sponsors, others were bought in different transactions – both online and from the mall. Also, I do apologize for the low quality image as I just took this photo from my iPhone and just did a quick edit from existing apps that I have (and also a big thanks to my sister, Angela, for doing the major editing). 1. EOS Lip sphere (Php200.00) – Lately, I have been using this to moisturize my lips before lipstick application. 2. In2It Brow Kit (Php299.00) – I’ve been using this product for almost a year now and I still haven’t hit pan! I use this alone without using any brow gels. 3. Urban Decay Naked Basics (Php1,800.00) – Ever since I got this palette, I have been using it in a day-to-day basis mainly because of its matte finish and its neutral color selection which is very much suitable for everyday use. However, for days that I don’t feel like wearing an eye color, I skip this product. 4. Urban Decay Primer Potion (Php1,050.00) – I just got this 2 weeks ago but I have been using the travel version of this which I got from the Naked 1 palette. 6. Revlon Photoready Airbrush Foundation (Php925.00) – I did a review on this a couple of weeks back and I just love how it gives me a natural looking face after application. 7. ELF Face Primer (Php350.00) – I really didn’t purchase this as it was sent to me by a blog reader. It doesn’t do much in terms of leaving my pores at time but it does the job in keeping my makeup stay in place for a couple of hours. 8. Revlon Age Defying with DNA Advantage (Php825.00) – I’ve been using this product for months now, however, I was able to get a couple of powders which I am currently juggling (depending on the weather and the place where I will be going). The price is almost the same with each other. 9. Mascara – Most readers I have know that I always use two (2) mascaras, one acting as base, and one acting as top coat – which is basically to seal it to avoid smudging and having raccoon eyes. 10. ELF Concealer (Php120.00) – I also got this as a gift from a reader and this one is relatively new to me. However, the past concealers I am using is somewhat in this range as well. After adding all these up, it came to a total of Php6,959.00 which still doesn’t include the shipping fee and taxes (since some products were bought from the mall). WOW! This is absolutely ridiculous! 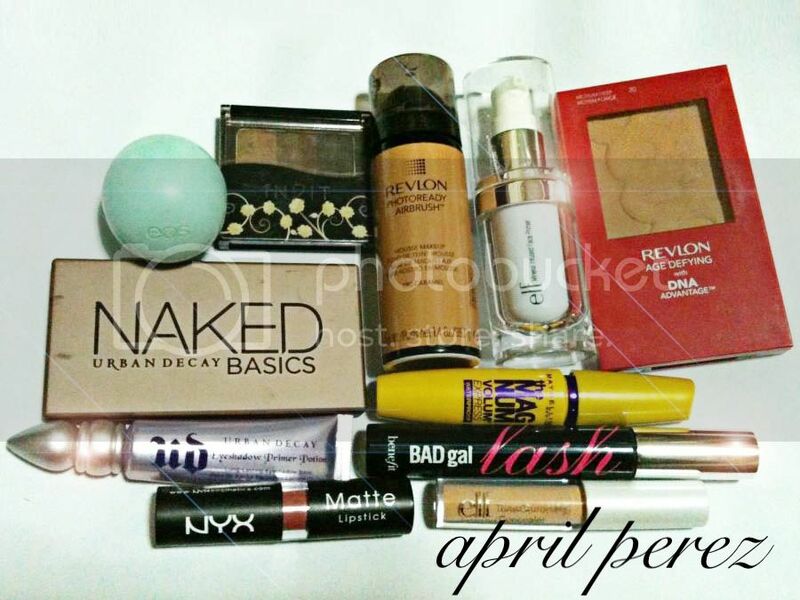 And these products aren’t even my high end routine makeup yet! If some of you calculated the price of the products you are using in an everyday basis, how much is the total? And if you already did this tag, do let me know by commenting your link in my comment box. Great post. I don’t think I’m worth that much since I don’t invest too much on make-ups I always wanna be on the go, so I only fix my eyebrows and a little lipstick or gloss then I’m good. Pano pa kaya pag sinama natin ang skincare routine natin no? Our faces would prolly cost an arm and leg already, haha! This is fun thing to do! I will bookmark and come out with my edition later on. But for a start, I am minimal on skincare and make-up routine. Probably the most expensive is my Benefit They’re Real mascara.